UPDATED: Wed., July 26, 2017, 9:05 p.m.
CARACAS, Venezuela – Opponents of President Nicolas Maduro at home and abroad tried again Wednesday to pressure the socialist leader into halting his plans to rewrite Venezuela’s constitution, though there was no public sign their efforts were working. The Trump administration announced sanctions on 13 current and former members of Maduro’s administration, freezing their U.S. assets and barring Americans from doing business with them. The U.S. also joined with a dozen other regional governments in urging Maduro to suspend Sunday’s election of a national assembly for rewriting the charter. Far from derailing Maduro, the Venezuelan leader appeared emboldened by the sanctions, praising those accused by the U.S. government of undermining the nation’s democracy and abusing human rights. 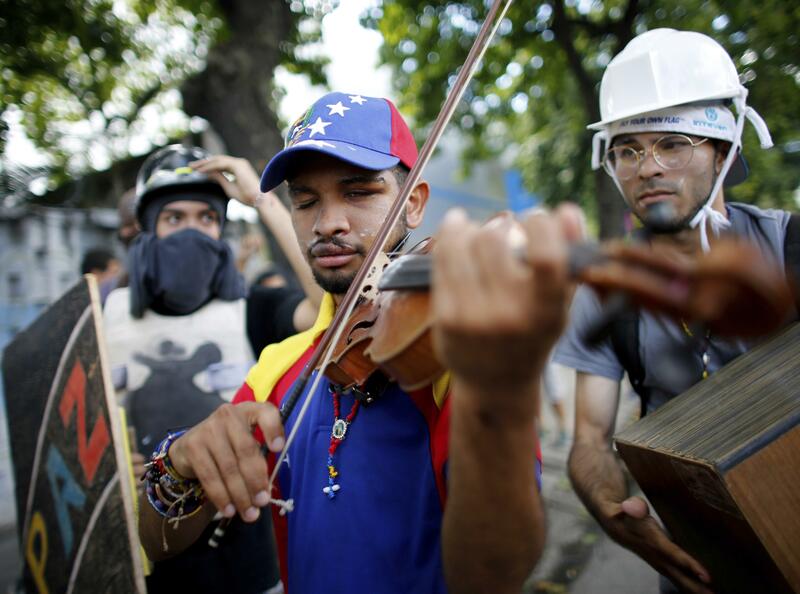 Those moves came as a coalition of Venezuelan opposition groups organized a second national strike in a week. Highways were mostly empty and businesses shuttered across the country as millions of people observed the 48-hour strike and activists threw up roadblocks in many neighborhoods to keep others from getting to work. By late afternoon, clashes between police and protesters erupted at some roadblocks in Caracas, and the chief prosecutor’s office reported at least one person killed. That increased the official count of dead in nearly four months of demonstrations to at least 98. Venezuela was less than four days from a vote that would start the process of rewriting its constitution by electing members of a special assembly to reshape the charter. The opposition is boycotting the vote, saying election rules were rigged to guarantee Maduro a majority in the constitutional assembly. Maduro did not address the nation Wednesday but state-run television was filled with scenes of his backers exhorting the public to go to the polls Sunday. Meanwhile, opposition leader Leopoldo Lopez called on Venezuelans to support the strike in his first direct public message since being moved from prison to house arrest this month. The 46-year-old former Caracas-area mayor, who was sentenced to 14 years in 2015 after being convicted of inciting violence during a previous spate of protests, also appealed to the military not to deploy for Sunday’s election. Among those hit by the U.S. sanctions were Tibisay Lucena Ramirez, the president of the National Electoral Council and president of Venezuela’s National Board of Elections; Elias Jose Jaua Milano, minister of education and head of the Presidential Commission for the National Constituent Assembly; Tarek William Saab Halabi, president of Venezuela’s Republican Moral Council; and Maria Iris Varela Rangel, a member of Venezuela’s Presidential Commission for the Constituent Assembly. In addition, penalties will apply to several members of Venezuela’s national guard, police and other security services, including Interior Minister Nestor Luis Reverol Torres, who was indicted last year by the U.S. Justice Department for his alleged role in an international cocaine distribution conspiracy. The Trump administration has said it is considering further sanctions, including restrictions on Venezuelan oil imports, a potentially devastating blow to Venezuela’s economy. The U.S. also said it had determined that Venezuelan Vice President Tareck El Aissami, hit with U.S. sanctions in February, had “hundreds of millions of dollars” in assets that have been frozen due to the sanctions. The U.S. has accused El Aissami of playing a major role in global drug trafficking, a charge he denies. El Aissami is the most senior Venezuelan official ever targeted by the U.S. The flagship airline in neighboring Colombia said it was suspending all flights to Venezuela, citing security concerns. Avianca joined a long list of air carriers that have suspended service to Venezuela as the country sinks further into economic and political chaos. June saw the last United Airlines departure from Caracas. A top Cuban official said his country had no intention of trying to mediate a solution to Venezuela’s crisis, rejecting the idea of what he called “foreign meddling” and voicing full support for Maduro, a key ideological and economic ally of the island’s government. “Those who from the outside try to give lessons on democracy and human rights while encouraging coup-mongering violence and terrorism should take their hands off that nation,” Cuban Communist Party Second Secretary Jose Ramon Machado Ventura said at a ceremony marking the anniversary of a failed barracks uprising that is considered the beginning of Fidel Castro’s revolution. Published: July 26, 2017, 9 p.m. Updated: July 26, 2017, 9:05 p.m.